External window cleaning and maintenance has been simplified by the abundance of glass cleaning agents on the market. However, these glass cleaning agents still require sufficient elbow grease to get your windows looking great - and can't even begin to rival the ease and effectiveness of self-cleaning glass. NSG Group made a significant step in the glass industry with the development of Pilkington Activ™, the first dual-action self-cleaning glass. 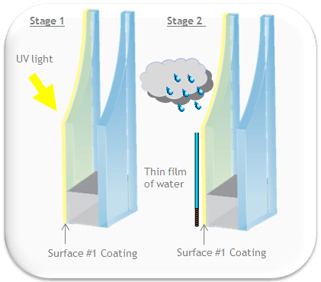 The unique dual-action of the Pilkington Activ™ coating uses the forces of nature to help keep the glass free from dirt, giving not only the practical benefit of less cleaning, but also clearer, better-looking windows. The first stage of the cleaning process is "photocatalytic". In this stage the coating reacts with daylight to break down organic dirt. The second stage is "hydrophilic". Here, instead of forming droplets, rainwater hits the glass and spreads evenly, running off in a "sheet" and taking the loosened dirt with it, also drying quickly without leaving streaks. If the thought of spending endless hours cleaning windows puts you off building a new conservatory or installing skylights then self-cleaning glass is precisely what you need. View this demonstration video to gain a better understanding of how self-cleaning glass works with the forces of nature to keep your glass cleaner.